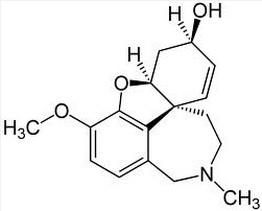 Galantamine is by far my favorite nootropic. Not only is it a mild acetylcholinesterase inhibitor, it also positively modulates the alpha 7 nicotinine acetylcholine receptor. The end effect is a global increase in acetylcholine levels and the facilitation of the activation of the particular type of receptor intimately involved in learning and memory. The strength of AchE inhibition is directly proportional to the reciprocal increase in the amount of acetylcholinesterase present. In other words, the stronger you inhibit the enzyme, the more the body produces to counteract its absence. This has been quantified in studies examining this effect with galantamine in comparison to donepezil, which saw much greater AchE enzyme elevation with donepezil. This isn't surprising since donepezil is roughly 40-300 times more potent at inhibiting this enzyme . In the context of Alzheimer's disease, or other forms of dementia, this fact is relatively unimportant since the user will continue to supplement with the AchE inhibitor until death. Conversely, for a healthy individual using an AchE inhibitor for a relatively shorter amount of time, this may result in fairly significant rebound once supplementation ceases. This effect would be considerably more muted when supplementing with galantamine, especially since nootropic effects can be seen with doses much smaller then what is required to inhibit AchE. What do you think about this meta-analysis and systematic review of cognitive enhancers, including galantamine, on MCI? Background: Cognitive enhancers, including cholinesterase inhibitors and memantine, are used to treat dementia, but their effectiveness for mild cognitive impairment is unclear. We conducted a systematic review to examine the efficacy and safety of cognitive enhancers for mild cognitive impairment. Methods: Our eligibility criteria were studies of the effects of donepezil, rivastigmine, galantamine or memantine on mild cognitive impairment reporting cognition, function, behaviour, global status, and mortality or harms. We identified relevant material by searching electronic databases (e.g., MEDLINE, Embase), the references of included studies, trial registries and conference proceedings, and by contacting experts. Two reviewers independently screened the results of the literature search, abstracted data and appraised risk of bias using the Cochrane risk-of-bias tool. Results: We screened 15 554 titles and abstracts and 1384 full-text articles. Eight randomized clinical trials and 3 companion reports met our inclusion criteria. We found no significant effects of cognitive enhancers on cognition (Mini–Mental State Examination: 3 randomized clinical trials [RCTs], mean difference [MD] 0.14, 95% confidence interval [CI] –0.22 to 0.50; Alzheimer's Disease Assessment Scale — cognition subscale: 3 RCTs, standardized MD –0.07, 95% CI–0.16 to 0.01]) or function (Alzheimer's Disease Cooperative Study activities of daily living inventory: 2 RCTs, MD 0.30, 95% CI –0.26 to 0.86). Cognitive enhancers were associated with higher risks of nausea, diarrhea and vomiting than placebo. Interpretation: Cognitive enhancers did not improve cognition or function among patients with mild cognitive impairment and were associated with a greater risk of gastrointestinal harms. Our findings do not support the use of cognitive enhancers for mild cognitive impairment. Personally, I've always enjoyed reading your posts on the (proposed) pharmacodynamics of nootropics, but considered them unproven and likely worthless in healthy populations. Unfortunately this study really seems to strengthen my thoughts. A meta-analysis is right above a case-study in terms of evidence-based research. The implications of this study are mostly nonsensical, and will change nothing in the context of AchE inhibitor prescribing. We know that administration of these drugs (most commonly tested with donepezil) improve cognition in healthy populations. We also know they improve the cognition and slow the progression of the disease of dementia patients. This study would have you believe that Ache inhibitors do nothing for those patients in between healthy and demented, and in addition, cause too many GI side fx. Ultimately I think it is a poorly performed analysis. The paper I referenced was a meta-analysis and systematic review of RCTs and used very strict inclusion criteria. This is pretty much considered the gold standard in scientific evidence. This paper is also in line with two previous Cochrane reviews, one of which (Briks et al., 2006) specifically reviewed donepezil in MCI(no evidence to support its use). I'm not sure why you believe this is a poorly performed analysis and think this class of drugs work in healthy populations, but I don't think the evidence is there (yet). In addition there is some circumstantial evidence which strongly argues against its efficacy in non-demented populations . For example, a very well-performed RCT (Blacker et al., 2004) of galantamine treatment in chronic fatigue syndrome, a condition associated with severe cognitive impairment, showed absolutely no effects on any outcome. If these drugs aren't efficacious in these populations, why would they work in healthy populations? You clearly have no idea what you are talking about. The gold standard is a randomized controlled trial. A meta-analysis takes multiple, typically poorly powered, mostly heterogeneous populations, and homogenizes them with arbitrary statistical programs. Meta analysis are a weak form of research. Furthermore, you cherry picked a negative study on galantamine with fibromyalgia. Since fibromyalgia is a symptom of depression, you wonder why a CHOLINERGIC drug did not improve cognition? I think you need to hit the books. While I don't appreciate the disguised ad hominem, I still respect your expertise on most boards and this blog, neuron. It seems you're too emotionally invested in this topic, so I'd rather cease the discussion, but you've made several false comments which need to be corrected. 1) Again (!!! ), the study I referenced was a meta-analysis and systematic review of RANDOMIZED CONTROlLED TRIALS of cognitive enhancers in MCI. They used very strict inclusion criteria to rule out bias and the (negative) outcome was in line with two previous Cochrane reviews (which you conveniently ignored). This IS considered the gold standard in scientific evidence, wether you like it or not. You keep claiming the paper was poorly conducted, but quite frankly, I don't believe you've even read it. 2) While you accuse me of cherry-picking, you're the one referencing a single donezepil study published in a third tier journal. I'm referencing 2 Cochrane reviews and a meta-analysis and systematic review published in a well-respected medical journal. 3) The well-conducted JAMA study I "cherry-picked" wasn't even about fibromyalgia (which isn't a symptom of depression anyway?!). I'm quite amazed how you could make this comment, but I guess it has to do with your emotional investment in this topic. Really neuron, I'm quite open minded, but the science is pretty clear in this case. There is just no evidence this class of drugs is likely to do anything positive in non-demented populations. Period. There is a difference between a randomized controlled trial and a "meta" research technique at analyzing them. There are outstanding computer programs that allow you to adjust the end points based on any particular proclivity and bias. Please go to a pharmacology conference and present a meta-analysis. I'll stand back and watch you get eaten alive. As I look back on your post, I realize now you referenced chronic fatigue syndrome. I'm not going to comment on this phenomenon. Thirdly, there are a dozen article this year which demonstrate donepezils ability to enhance memory formation in healthy populations. Feel free to utilize google scholar. Hey, neuron is there a way for me to message you privately? My inbox on bb.com is open. Thank you for all the informative information. Can I request a invitation to your private blog? Nice try. The blog is invite only. "Use of Cognitive Enhancers Discouraged in Some Patients"
I've kind of touched on that before. The study is saying that there is a group of people diagnosed as "MCI" that sometimes initially respond to AchEi's and then become refractory to them over time. The term "Mild Cognitive Impairment" is a clinical diagnosis based on a broad constellation of symptoms that do not fit the diagnosis"dementia." There is no laboratory or imaging test to diagnose MCI. Some people think of it as "pre-dementia," or "dementia light," but this does not accurately reflect the reality of the "illness." Only a small portion of these people actually develop dementia, and some people actually improve (whereas dementia is a chronic and persistent deterioration). Their is no unified pathophysiology behind MCI and in fact it is mostly a diagnosis of exclusion. For this reason, AchEi's are not universally effective at treating it. For example, if someone had a borderline IQ throughout life and then presented to a physician after a mild TBI, the diagnosis of MCI could be made. No one would expect an AchEi to be particulally useful in this context. On the other hand, if someone had a predisposition for true dementia then chronic use of an AchEi might be especially helpful. Chronic comorbidities confounding the diagnosis of MCI include vasculopathy, especially related to tobacco use or poorly controlled diabetes. The benefits of an AchEi would be exponentially dwarfed by the magnitude of the brain damage caused by these conditions. Also, any merit to dosing 16mg or 24mg ? can i have access to this please?